This week Eli and guest host Steve Strohmeier play a bunch of old recordings of songs Bob Dylan has been strongly inspired by over his long career. These are songs that Dylan has heard and then used the melody, the lyrics or parts of both to create his own songs. In this way he has taken the older forms of music that he was exposed to and changed the feeling to suit himself and his contemporary audience. 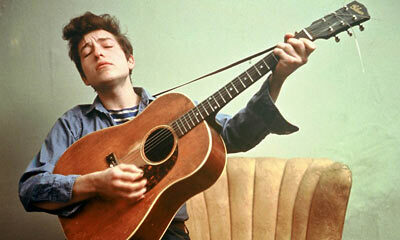 In this show we take a direct look at how Bob Dylan takes various songs and forms of music and “Bob-Dylanifies” them. This Stuff Sounds Like Bob Dylan! One of the main points of today’s show for me was to tryin’ drive a nail into the coffin of “originality.” Musicians, probably artists in general in this country seem to be real hung up on being “original.” That leads to bad art. Steal stuff! Steal it from everywhere constantly. You’re doing it anyway unconsciously, might as well embrace it and do it more consciously. Generally speaking, if you think somebody made something up, its just because you don’t know where they stole it from. Another main point is, don’t just check out Bob Dylan’s music, its well worth it for any music lover to check out the wonderful variety of folk and popular music that Dylan himself has listened to and loved. These are songs that Dylan has heard and then used the melody, the lyrics or parts of both to create his own songs. In this way he has taken the older forms of music that he was exposed to and changed the feeling to suit himself and his contemporary audience. Bob Dylan takes various songs and forms of music and “Bob-Dylanifies” them. Bob Dylan is one of the most successful popular assimilators and remakers of American folk/vernacular music from his generation- and his generation was a kind of pioneer generation. The development of music in the last 80-100 years has been very rapid so its hard to say where things begin, but the 60’s was a watershed era and Dylan was there from the very early stages with a fresh and compelling approach. Dylan achieved a powerful mix of forces and an alchemy which is in many ways very hard to dissect. What’s in his sauce?! We hope this show offers some perspective on that and gives people some traction. However, as great as it is to become aware of Bob Dylan’s direct sources, its his talent and ability to combine them, creating a whole greater than the sum of its parts, that is truly inspiring. **If you know of any tracks that directly relate to a Bob Dylan song and that we missed on these programs, please email me that information at DownHomeRadio@hotmail.com . Thanks. ***We don’t know if the versions of songs we play here are the actual ones that Dylan heard and learned from. They’re just versions we like! All the spoken interjections by Bob Dylan are taken from a recording of Dylan appearing on Cynthia Gooding’s radio show “Folk Singer’s Choice” on WBAI in New York in 1962. Bob Dylan claims authorship of the old song “Rolling and Tumbling” on his new album “Modern Times.” However it should be noted that apart from the first verse as far as I know all the lyrics are his own. You can’t copyright a title and people have been claiming authorship of slightly changed old folk songs for years, forever, so why not Bob Dylan now? I think its perfectly fine, and no one suffers for it in any case. Plus our whole system of intellectually property rights, authorship, royalties, etc. is completely screwed up anyway. But I won’t even get started on that. Read Mat Callahan’s book “The Trouble with Music” for a discussion of that. On the other hand, it seems like Dylan’s flagrantly claiming authorship of “Rolling and Tumbling” is a somewhat deliberate attempt to stir up the pot on this issue. According to Dylan’s autobiography, put in simple terms he was most inspired by the combination of “[Robert] Johnson’s dark night of the soul and Woody [Guthrie]’s hopped-up union meeting sermons and the ‘Pirate Jenny’ framework.” P. 288, “Chronicles, vol.1” by Bob Dylan . Clearly as demonstrated by this show he was inspired often times directly by many other sources. But I think that that is an interesting and concise way to state the influences at the core of his development. It seems like Dylan has been real into Gene Austin lately (and many other things as well I’m sure). In fact he’s getting to be rather like Gene Austin in a Bob Dylanified way. He’s taking his music into the same sort of folkloric country jazz territory that Austin did back in the 1920’s. When I was a clerk at a record store, Down Home Music, in El Cerrito, CA in 2005, Greil Marcus stopped in and he was the one who told me about Austin and the Lonesome Road song. Thanks Greil. Also thanks to my co-host Steve Strohmeier who discovered the connections between a bunch of these songs. And also thanks go to Nathan Salsburg for sending me the Luke the Drifter track. The chorus of the Dylan song “Mississippi” from Love & Theft is taken directly from a Mississippi prison song collected by Alan Lomax at the Parchman State Penitentary in Mississippi. “Blowin’ in The Wind” – The melody is derived from the old song “No More Auction Block,” which Dylan adapted for guitar and voice and you can hear on the bootleg, The Gaslight Tapes 1962. “Don’t Think Twice, It’s Alright” – Derived from Dylan’s friend Paul Clayton’s “Who’s Goin’ to Buy You Ribbons When I’m Gone?” which he recorded on several albums around 1960. -This is another unaccompanied work-song field receording that Dylan adapted for guitar and voice. “Honey, Just Allow Me One More Chance” from Free Wheelin’ is based on the Henry Thomas song of the same name. Also, Bob Malenky suggested to me that the song “Betty and Dupree” particularly Brownie McGhee’s version, might be the template for “She Belongs to Me.” They have the same chords and structure and a similar kind of melody. Smithsonian Global Sound – You can here a lot of great music at this site, and buy it right there if you wanna hear the whole track. If you want to know more about the music we played today on the show that Dylan was inspired by this is a great place to start. The Formative Dylan – Todd Harvey’s excellent book about Dyan’s early sources and influences. Todd Harvey is a collections specialist in Reference at the American Folklife Center, Library of Congress and curator of the Alan Lomax Collection. BobDylanRoots.com – Great, site lots of good information. Some links do not work, but I am told it will be updated soon. Henry Timrod– “The Poet Laureate of the Confederacy.” In September 2006 an article for The New York Times noted similarities between Bob Dylan’s lyrics in the album, “Modern Times” and the poetry of Timrod. A wider debate developed in The Times as to the nature of “borrowing” within the folk tradition and in literature. Read the NY Time article. Love & Theft: Black Face Minstrelsy and the American Working Class- Book by Eric Lott with the same title as Dylan’s record. Annotated Love & Theft website – This is a really cool website telling all about Dylan’s sources on L & T.
The Annotated Bob Dylan – This site has a lot of material, maybe more than one wants to know, but there’s some good stuff in here. Arthur Rimbaud – French poet that Dylan liked. List of Bob Dylan Related Internet Sites – Fan sites, other stuff, etc. When I heard the “The Lonesome Road” by Gene Autry, I knew I had heard the melody before. It turns out that the early white blues artist Tom Darby did a version called “Lonesome Raiload”. The musical structure is closer to the Snooks Eaglin version, but the vocals are closer to Autry’s. It’s funny, I’ve heard “Sugar Baby” numerous times, but never recognized it until I heard these other versions. Thanks again. I hear a great connection between Dylan’s “Pretty Peggy-O” and Odetta’s version of “Santa Anno” from the 1963 live recording at Town Hall. Love to know what you guys think. Keep up the great work. I played many of the coffee clubs that paul clayton played in the 1960’s and knew paul fairly well. I have been trying for some time now to get a copy of his song who’s goin to buy you ribbons when I’m gone (home-made songs and ballads Monument 4001) Do you know where I can obtain a copy of this? I don’t have that record and I cant seem to find that track anywhere. There’s a lot of Paul Clayton stuff available at http://smithsonianglobalsound.org/ but not that one. If anybody out there has it, please contact me at DownHomeRadio@hotmail.com . Great show. I stumbled on to it late..but better late than never. Interesting that you made the transparent connection between the track on Modern Times and the Muddy Waters tune. This got my wheels spinning and it reminded me of a time when I was listening to Blood On the Tracks…specifically the cut entitled Meet Me in the Morning. I was also listening to a Chuck Berry album at that time called Bio. (A great record in my opinion of tasty bluesy, wacka wacka 70s guitar stuff). So anyway it struck me just how much Meet Me sounded like this entire Chuck Berry album. Check it out…I wonder what you all think. Maybe there is just a commonality between them because of the blues sound but it even sounds like Dylan is imitating Berry’s vocals. That being said I love Bob…and Chuck. Keep up the good work. You both have really annoying trying to sound like Bob Dylan voices. That is not true! We might be big Bob Dylan / folk music nerds, but we speak in a way consistent with our family, regional and socio-economic backgrounds. And our voices aren’t annoying either. They’re pleasant and radio friendly. And as long as I’m commenting on my own post- Thousands of people have listened this show. Why don’t you people comment? What the hell!? How boring of you. The folksong Nottamun Town –Dylan uses the tune for Masters of War. Likewise, Liverpool Farewell becomes Farewell, and The Parting Glass becomes Restless Farewell. Although he goes in another direction with it, the line “go away from my window” from It Ain’t Me Babe is obviously inspired by the John Jacob Niles song Go Away From My Window (which Joan Baez performed in her early days). And I’m hoping you can find that Paul Clayton song. I’ve wanted to hear it for some time. I heard it was derived from a traditional song possibly called Who’ll Buy Your Chickens When I’m Gone. Also Girl from the North Country obviously is based on Scarborough Fair. And now I have a research project for you. In Dave van Ronk’s autobiography, he mentions that his grandmother used to sing a song called “The Chimes of Trinity” which van Ronk taught to Dylan who reworked it into “Chimes of Freedom.” I’ve never heard the former song and wonder if you can find a recording of it. You guys are just plain awesome! I loved Frank Proffitt’s miraculous version of Lord Randall.